As well as the lecture we also went to a gallery talk at the Open Evening - these are where a curator takes you around some objects of interest in a gallery for 45 minutes or so. The theme of this one tied in with the Shakespeare exhibition, and was in some ways an extension of the central room of the exhibition. Shakespeare set several of his plays in Venice and (as discussed in both the exhibition and this talk) this was for several reasons, including the fact that it allowed him to portray situations that might've got him in trouble if he'd set them in England. 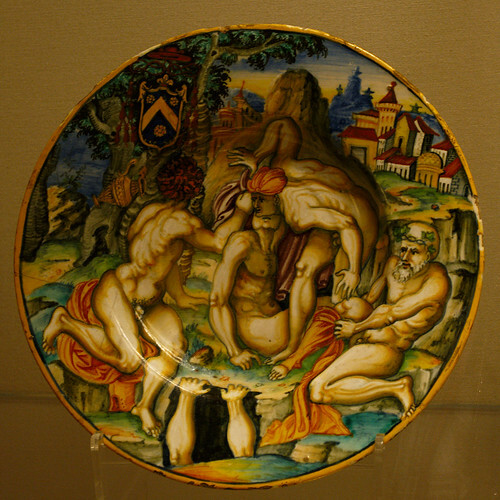 Venice was also widely known as an exotic, tolerant place where luxurious goods came from. During the gallery talk she showed us various pieces of ceramics & glassware that had come from Venice around the time of Shakespeare or just before. Shakespeare himself is thought never to've gone to Venice, but he would've known about the place both from reading published works about it, and through objects like the ones she showed us which he would've seen in the houses of the aristocracy. One of the things it seems hard to remember is how exotic good quality glass was at the time. 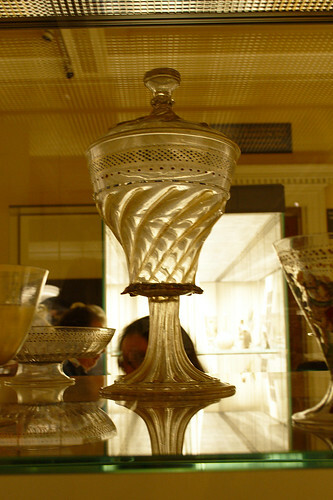 The glassware of Venice was famous throughout Europe, and to have a Venetian glass salt cellar or marriage cup really showed how high status & wealthy you were. The glassmakers of Venice were apparently forbidden to leave the city, so that the recipe for their glass remained a secret only known to Venice. As well as showing us several objects & setting them in their cultural context she also read us a story from an old guidebook to Venice - which labelled a house as where a man had murdered his wife. I've unfortunately forgotten the names, but the name of the family was reminiscent of "Moor" although they were not Moorish, and the name of the wife was similar to Desdemona. So it's possible that Shakespeare didn't just get an exotic stage set from his reading about Venice, but perhaps also the start of one of his plot lines. And for a bonus picture - here are the Christmas decorations at the British Museum. 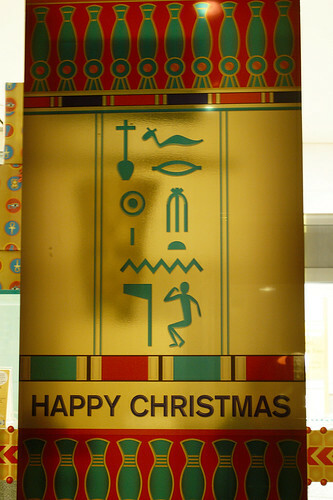 They even say something sensible in the hieroglyphs - something like "Beautiful birthday of God's child".